In one of the most complex borders of the world, the physical limit is materialized in what seems to be just a simple fence. Yet, that does not mean that the barrier is weak. As this text indicates, the border infrastructure in Ceuta is a complex assembly of physical artifacts, legal constructs and calculated exceptions to these rules that, in the end, generate a border with selective porosity. Ceuta serves to amplify and highlight the contradictory logic followed in the management of the European borders - at once porous and impenetrable. I propose to explore the border condition as a legal, economic, political and material infrastructure and, consequently, analyze it as a complex constructed reality rather than just a division line. Thus, the border is re-conceptualized as something broader; an ecosystem in itself that generates and activates its own choreographies of space. The city is the closest border between two continents: Europe and Africa. It is also located at the border of two bodies of water: the Atlantic Ocean and the Mediterranean Sea and, as such, it flanks the sea’s main door. Lastly, throughout history, it has materialized as the cultural and religious border between Christianity and Islam. The specificity of Ceuta’s geolocation and the scale of the city provide a very paradoxical border condition, up to the point that the whole city could be described as a border: one that is in itself a large amount of legal and territorial contradictions that transform this territory into a “limboscape” (Ferrer-Gallardo and Espiñeira, 2015). Through its history, Ceuta has accumulated a broad diversity of encounters where the political and cultural sovereignty, as well as the borders of the city, have been disputed. Figure 1 European Security Fencing website. The very origin of Ceuta’s border definition - and the consequent recognition of it as belonging to the territory encapsulated within that border - is controversial. Since the normalized condition to fulfill membership (and thus to belong) to a territory is ‘sedentarism,’ all the ‘nomadic’ sovereignties that have passed through this territory are automatically eliminated. Taking this condition as a starting point already entails a very complex and contested nature of belonging with regard to this territory. In 1986, Spain joined the European Union. A few years later, in 1991 and as part of this new integration, it also joined the Schengen Agreement - a territorial agreement that defined the “Schengen Area” as a borderless zone that would allow the free circulation of citizens (of the involved countries) without a visa. As an immediate consequence of the Schengen Agreement, Ceuta became the new southern border of the EU - specifically, the EU’s only land border with Africa (along with the city of Melilla). However, contradictorily enough, Ceuta politically belongs to the EU (as part of Spain) but its territory falls outside the Schengen Area. In this way, Ceuta became a European border outside the European continent - an extraterritorial border. But things are even more complex. Ceuta is inscribed within a double border condition. To the South, the border with Morocco is formed through a fence, and to the North, by the Mediterranean Sea. In the latter, the Ferry Port Terminal that connects by water transportation with the Iberian Peninsula legally constructs the ‘doors’ of the frontier. Ceuta’s Port flanks thus one of the sides of the Strait of Gibraltar - the only sea access to the Mediterranean from the Atlantic Ocean. The other flank of this entrance is its symmetrical equivalent located in the Iberian Peninsula, a territory that surprisingly (or cynically) belongs to the UK: “The Rock of Gibraltar” was transferred in 1713 to the UK in one of the articles of the Treaty of Utrecht. Since then, it has acted as a fortified, very strategical military point to control the sailing routes in the Mediterranean Sea, despite many claims over this territory by the Spanish Government, with a special emphasis after the Decolonizing agreements led by the UN.6 The dispute over this small piece of territory is hardly a coincidence since, thanks to that portion of extraterritorial land, the UK has its own access to the Mediterranean Sea. Military control has historically been the main function of these two territories, Ceuta and Gibraltar and, as such, they can be read as the materialized outcomes of securitization processes and political agreements. Figure 2 Map of Ceuta, Spain. This text will focus on the infrastructures that materialize the legal apparatuses at play in this case: firstly, describing the overall role of Ceuta in the “Schengenization” process and the role specifically performed by the fence; and secondly, analyzing the two outcomes of this complex relationship. On the one hand, the selective porosity that border regulations reveal in Ceuta - a reflection and amplification of the EU’s contradictory and paradoxical border behavior - and, on the other hand, unpacking the architectures that perform this selective porosity and the daily reality of its outcomes. The role of Ceuta in the securitization plans of the European Union goes far beyond what could be read at first glance. The fence that divides the European/Spanish territory from the Moroccan one performs a very complex role through its very materialization. The words of Etienne Balibar, calling European strategies “the new apartheid,” reinforce the claim of “the European construction as a ‘post-national’ institution (…) destined to leave no realm of social life unaffected by its ‘security’ requirements” (Balibar, 2011:1). Among all the constructions in the name of ‘security,’ building Ceuta’s fence represents the in-situ materialization of such political borders - a border constructed through history. As Balibar also puts forth, “walls are not passive structures,” but in fact “lines of crystallization” (Balibar, 2011:4-5), active and organic articulations that explicitly reflect political decisions. For instance, the changes in height of the fence can be inscribed within very precise political periods and are a reflection of the Spanish Government’s decisions against the different waves of migrants. Also, considering the fence’s physical materialization, its disposition performs the duality that a border embodies. The border is constituted by a double fence with approximately 4 meters of separation. This 4-meter space is surveilled by patrols on foot. On the side corresponding to Spanish territory, the fence is surrounded by a line of streetlights very close to each other followed by a two-lane highway for car patrol controls. The very existence of two fences represents the two surveillance powers over the border: the Moroccan and the Spanish. This duality is taken to the extreme when considering that immigrants that die on the Moroccan section of the fence are considered a Moroccan issue, just as the bodies that fail the second jump - i.e. the second fence corresponding to Spanish surveillance - are the responsibility of the Spanish. So then, whatever happens halfway usually becomes a tug-of-war between both countries. It is the very materiality of the separation that physically articulates the duality of the law. 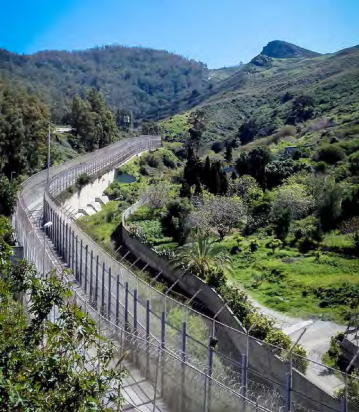 Although the fence is the first immediate materialization of border policies as well as the most visible one,8 the articulation of Ceuta’s territory goes beyond the fence. It is a territory where several legal layers overlap but do not coincide and leave legal loopholes that enable incongruous realities. It is also a territory where many different architectural devices participate in the materialization of the migration regulations. Figure 3 Ceuta border fence. The Sub-Saharan migrants who manage to enter Ceuta (either by jumping the fence or by swimming) enter a territory that is suspended between two borders: the fenced land border with Morocco and the controlled water border with the Mediterranean Sea. Once inside, migrants are kept suspended in this legal “limboscape,” where their “trajectories towards ‘European-EU’ are spatially and temporally suspended”(Ferrer-Gallardo and Espiñeira, 2015:251). The paradox emerges when this immobility encapsulates bodies in a site where they cannot stay nor can they leave. It is the very materialization of pure contradiction by ‘being forced’ to stay in a place where they are forbidden to stay, an enclosed territory where the incapacity to absorb this illegality emerges as one of the main urban features of the city. Although repatriation is the only conceived legal solution, the status of these immigrants is characterized by a condition of “undeportability,” mainly because their country of origin does not make a claim on them - since that would entail assuming the costs of the deportation. In other words, the State, insisting on its sovereign right of expulsion, has provided a framework that considers the possibility of expelling them out of the country; yet, there is no solution to the potential possibility of them staying in Ceuta - since this option is not even considered as ‘likely to happen,’ there is no legal recognition of its possibility and, consequently, no solution is needed. 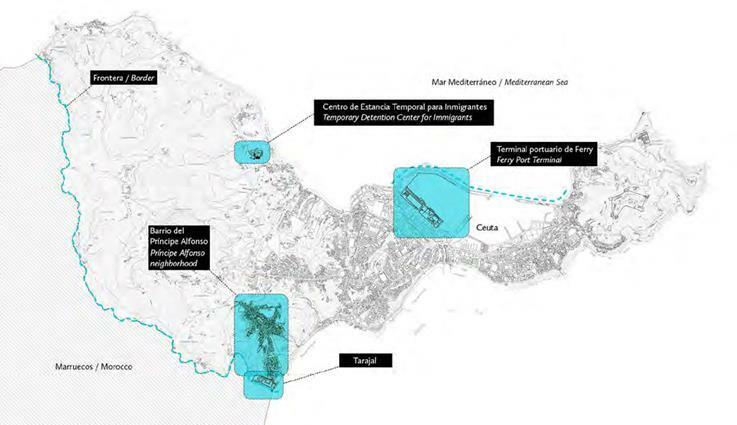 Thus, as the only recognized possibility is for these immigrants to stay on a short-term basis in Ceuta until the deportation, the only provided infrastructure is the CETI - Centro de Estancia Temporal de Inmigrantes (Temporary Detention Center for Immigrants). The CETI is a building with a capacity of 500 beds for 500 immigrants. 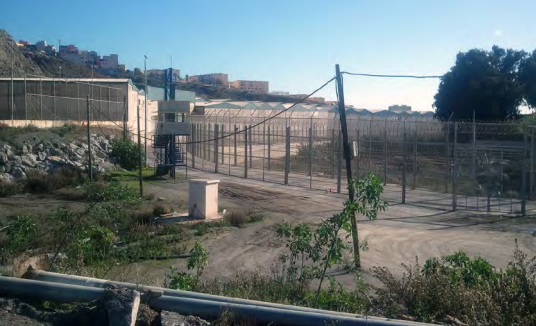 This prison-like building is the only existing infrastructure to accommodate the immigrant population in Ceuta. However, the estimated number of immigrants that stays in Ceuta for more than 5 years is around 2,000 people; of all of them, around 1,400 are concentrated inside this building while the rest (of uncertain total) live spread throughout the woods or wandering around the city, without being able to settle in any house or residential area. Although the figures may not seem like a large amount, their impact is extremely disturbing. A proportional reading of these figures leads to the understanding that almost a 2% of Ceuta inhabitants live in one building and that the CETI, with a total surface of 4,956 m2, has a density of 0,28 inhabitants per m2. This means that a single building has a density of 280,000 inhabitants per km2 while Ceuta’s average density is 4,100 inhabitants per km2. This also reflects contradictory investment priorities: around 289 million Euros were invested in the border control while only 9 million Euros were spent to provide primary care and infrastructure to host the immigrants. In it, the state of exception, which was essentially a temporal suspension of the state of law (in the case of Ceuta just for some but not for others), acquires a permanent spatial arrangement that, as such, remains constantly outside the normal state of law. (…) The camp is a piece of territory that is placed outside the normal juridical order (Agamben, 2000:39-40). The paradox here is when both juridical orders cohabit over the same territory. In such a way, the citizens of Ceuta legally occupy the same territory over which certain ‘other persons’ circulate under a regime of exception that does not allow them to leave the bounded space demarcated by this exceptional jurisdiction. Ceuta is then a city for some, and a camp for others. When any immigrant enter Ceuta, he/she believes is leaving or escaping, and entering into a status of freedom in the European ‘promised land.’ However, once in there, their leaving becomes falling into a trap with no exit. In contrast with the Sub-Saharan migrants’ status, which persists with an unclear and unplanned outcome, the status provided for Moroccans is a very explicitly designed one. In fact, the condition of Moroccan circulations into Ceuta is provided by one of the few exceptions to the Schengen Agreement. Less designed is, however, the limit to which that exception can be taken. Before the Schengen Agreement, and according to the previous Spanish Ley de Extranjería (Law on Foreigners) of 1985, most of the Muslim citizens established in Ceuta and Melilla did not have access to Spanish citizenship. After intensive protests from the Muslim inhabitants of these cities, a massive regularization took place. However, at the same time as the old religious-symbolic borders were being dissolved inside these cities, new and profound dividing lines started to appear between the bordering communities on both sides. It was in 1991 when the new Euro-African borders (Ceuta and Melilla) became the exterior borders of the Schengen Area. The same year the first migrants’ deaths in the Mediterranean Sea trying to illegally cross the Strait of Gibraltar were broadcasted, and it was also in 1991 when a very carefully planned exception of the mentioned agreement was implemented. This exception allowed for a selective flow of certain Moroccan citizens: the Schengen border was hermetic for most of them, yet it was very porous for the citizens of the territory of Tetouan. Such porosity is enacted through a 24-hour visa that creates a constant transit of 30,000 to 40,000 people from one country to another on a daily basis (Ferrer Gallardo, 2008:136). Figure 4 Ceuta border fence. In addition to this Schengen legality, there is also a very complex economic and fiscal framework10 between Ceuta/Spain and Morocco. On the one hand, Ceuta has an exceptional taxation framework that, along with a big economic difference between both sides of the border, makes Ceuta the perfect arena for informal exchange. But this is not the only exceptional condition regarding economic and commercial exchange. On top of this entanglement is the strange fact that there is no recognized customs border between Morocco and Spain. Although the official reason for this seems to be political - Morocco argues that a custom border would imply recognizing Spanish sovereignty over that territory - the informal economy this condition generates allows to speculate that economic and commercial interests are in fact the true motivation. Thus, there is no official way to make commodities circulate while, in terms of fiscal regulations, human bodies have all the right to do so under the ‘regime of the traveler,’ which allows a person and his/her bag to freely cross the border. With both regulations at play - the fiscal one that allows the circulation of a body and a bag, and the Schengen exception that allows Moroccan’s to enter the Spanish/European territory for 24 hours - the human body of some Moroccans becomes the only potential vehicle to cross commodities through the border. The optimized outcome of this arrangement is women porters (las porteadoras) who carry up to 70 kg embedded onto their own clothes and in a gigantic bag carried on their back. The legal framework that enables this informal economy is in turn supported by two physical devices: the body and the industrial estates that serve to store the commodities brought by it. This storage space is the “Polígono Industrial del Tarajal” (Tarajal Industrial Estate), a compound of warehouses close to the Muslim neighborhood of Ceuta, Barrio del Príncipe. As legality only allows the traveler trajectories as walking paths, the location of this storage cannot be far from the border. Not coincidentally, El Tarajal is literally fixed to the border: its back wall is the border itself, being the only section in which the double fence is replaced by a concrete wall. Here, as a material counterpart to the selective porosity of the border, it is not visibility but rather opacity what is needed to hide what happens inside the warehouse - even if it is common knowledge. Next to El Tarajal, the border has a main entrance: the wall is substituted by a large roof shelter hosting small kiosks where the official border control checkpoints ask for passports between Morocco and Spain. This is the door that the women porters use to enter Spain, free of any load. However, they do not leave with their full bundle the same way: they leave Spain to re-enter Morocco through the back door, a little bit to the west, and literally an opening in the concrete wall. After crossing this door, the women porters are already in Morocco, but in the middle of the natural surroundings. The careful architectural articulation of the fence/wall, through its main and back door, choreographs a paradoxical confluence of circulations, previously pre-designed by legal articulations. Thus, the architecture of El Tarajal and that section of the border are part of a diagram of political and power relations (Weizman, 2006:90) towards certain bodies and towards all kind of commodities. Figura 5 Woman porters’ caravan. Contrasting with the liberal discourse, “which insists on free circulation as a sort of natural right” (Balibar, 2011:5), the multiple materializations of borders point out paradoxical realities. Considering the legal articulations that enable the reality of the women porters we can ask: what is allowed to freely circulate? Are the citizens of Tetouan? Are the commodities? 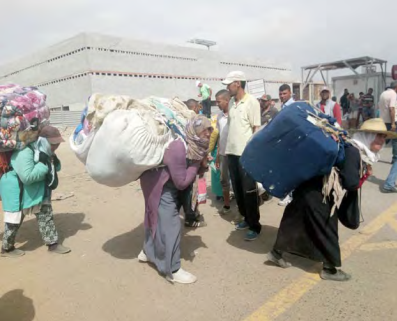 Are the labor-force embodied by those Moroccan immigrants? Whatever the reason to produce the Schengen exception, what is certain is that it has been designed without considering the effects on the subjects engaged with all these circulations. The exception of Schengen can be understood, in the words of Balibar, as “inclusion and exclusion, legality and illegality, admission and repression”, especially when considering Mezzadra’s claim on the functionality of borders, which justifies controversial combinations (Balibar, 2011:18). Among these contradictions, the rules of capital circulation on a globalized basis make this functionality the perfect excuse for the circulation of labor-power (Balibar, 2011:18). It is this perverse subversion which transforms human bodies into objects at the service of the market and economies that, although informal, follow the same rules as the most formalized capitalist systems. The women porters are the outcome of migratory policies and extraterritorial regulations that visualize the objectification of subjects that takes place in the process of law-making. As Feldman and Ticktin describe, it is the governing regime that which “not only regulates intervention into humanity as (an) object” but also “defines which persons ‘count’ as subjects for this object” (Feldman and Ticktin, 2010:18). As a result, those who do not fall into the category of subjects of humanity are immediately set aside as objects, with all the dehumanizing implications that this category carries. When considering the Israeli security terminals, Weizman claims that “the security doctrine (…) puts up walls and conceptually “un-walls” them, (…) conceives walls as transparent and permeable from one side (but not from the other)” (Weizman, 2006:94). In Ceuta’s fence these gestures of “un-walling” do not respond to a logic of visibility for some and invisibility for others, but rather to a selective porosity not only regarding citizens versus immigrants but also creating differential behavior in relation to the origin of the immigrant. Therefore, if the fence/wall is there to protect something, what is it that these complex physical and legal infrastructures are protecting? Considering both trajectories, it can be argued that the selective porosity reflects the “institutional polysemy of the border as a line of separation” (Balibar, 2011:5). Also, the unpacked contradictory spatial articulations inside it show that the border becomes practically indiscernible from the space (both geographic and institutional) that it encloses and protects. Thus, what needs to be asked is, to what extent is the paradoxical ‘coincidence’ that enacts Ceuta the outcome of a planned or unplanned legal and political construct? Furthermore, assuming it is an unexpected outcome of the materialization of all those legal and physical infrastructures, what is the responsibility of those legal agreements over the controversial unexpected physical reality of that land, those paths, and those bodies? * Maite Borjabad López-Pastor Architect, ETSAM, Universidad Politécnica de Madrid. Visiting student at the Illinois Institute of Technology where she was awarded the Dean’s List of Excellence. M.Sc Critical, Curatorial and Conceptual Practices in Architecture, GSAPP, Columbia University, New York. She has worked at The Metropolitan Museum and the Arthur Ross Architecture Gallery (NY). As an independent curator she has developed diverse exhibitions, symposia, happenings and events focusing on varied forms of critical spatial practices in collaboration with the Emily Harvey Foundation, New Museum Incubator (NY), Tabakalera (San Sebastian) or La Casa Encendida (Madrid) among others. Her work has been published in diverse media as Pin-Up Magazine, Domus, Dezeen, Metalocus, Yorokobu, e-flux, the Chicago Tribune or El Cultural.